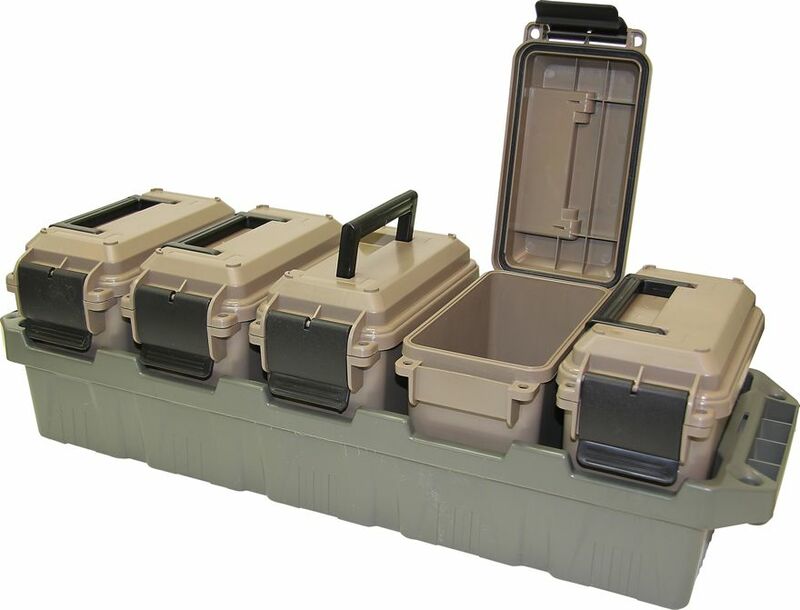 A rugged tactical carrying crate for multi-caliber ammo storage and transport. Comes with five, O-ring sealed Mini ammo cans(AC15) for multi-caliber ammo storage. The Mini ammo can is not so mini, when you consider, it will hold 700 rounds of 9mm bulk ammo. 400 rounds 45 ACP or 223 bulk ammo. With five Mini’s you can organize by ammunition, pistol magazines, brands, handguns, etc.. As versatile as they are sturdy, loaded crates are stackable, with carry handles and tie-down points on either end for ATV attachment. Made of rugged polypropylene to last. Made in USA. • Mini Ammo Cans are a convenient size (8.4”x4.4”x6.8” tall) and can store 650 rounds of 9mm bulk ammo. • Heavy-duty latching system makes for a better seal. • Strong comfortable handle and double padlock tabbed for security.